Team KAIST from Korea won the DARPA Robotics Challenge, held at the Pomona Fairplex in California on June 5th and 6th. KAIST was closely followed by Team IHMC from Florida and CHIMP from CMU. All three teams scored the maximum 8 points in one or other of the two final rounds, where robots had to complete 8 difficult tasks within one hour, including a surprise task. With three teams scoring maximum points, the contest became a race. KAIST was able to complete the whole challenge in only 44 minutes. Source: DARPA. With this robotics Grand Challenge, DARPA has advanced both the science of robotics and the story. Real robots did useful things, like operate power tools, drive cars and climb stairs far more successfully than we anticipated. But at the same time, the world saw that it was incredibly difficult for them to perform simple human tasks like opening a door. Anyone who is worried about robots stealing their jobs, or killing us in our sleep, can sleep a little sounder tonight. Most of the world only sees robots in sci-fi movies like Terminator, Chappie and Ex Machina, in out-of-context Youtube videos, or in popular robot combat events, like Battlebots or RoboGames. No wonder real robots are so often a disappointment. Anyone who is worried about the robot apocalypse just needs to keep their doors closed. If we were keeping score, then doors definitely beat more robots than any other challenge. Some robots just stared at the door for most of the round. Some fell over trying to open the door. Others managed to open the door, then fell over trying to get through. Some robots (like MIT’s Atlas) actually got a point just by falling out of the car or through the door – because they landed across the designated finish line when they fell. But the robots weren’t just falling over because of the doors. RunningMan, the 2nd place finisher from Team IHMC, fell over while waving to the crowd after successfully completing all eight tasks. So we can forget the “robot apocalypse”! DARPA released a 1-minute showreel of robot pratfalls set to the 1812 overture. It’s brilliant PR! In the 2013 DRC trials, only 18 months ago, the 16 qualifying teams were allowed a half hour for each challenge task and could reset the robots between each task. Robots were also tethered to power supplies and in constant communication with robot operators. Only 13 of the 16 teams scored any points; only four teams scored points driving the car; and only three teams scored more than 50% of the points available. Fast forward to the 2015 finals where 25 teams qualified and 23 competed. Teams had to complete all 8 tasks within one hour, while carrying their power on board. 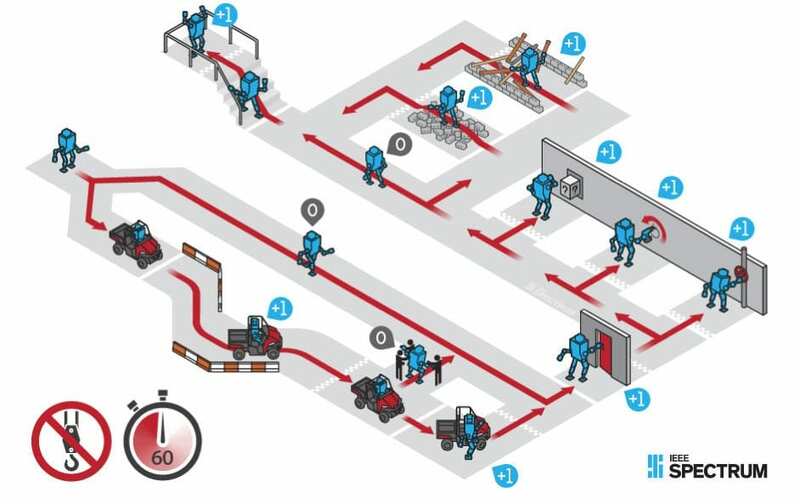 Communications between robots and operators were degraded during much of the challenge to imitate real life disaster conditions. In spite of the big increase in difficulty between trials and finals, 19 teams scored points, 18 attempted the drive and 10 teams scored more than 50% of the available points. Interestingly, one thing that didn’t change much from trials to finals were the team placings, with half of the top six teams staying in same rank as in 2013. While CMU’s Chimp had a strong lead after Day One, they were unable to repeat their success or improve in rankings and were overtaken by KAIST and IHMC. I’m sure this is much to the chagrin of CMU, who have a history of being pipped after early leads in Grand Challenges. Another fun fact is that the DRC teams with best performances mostly used ‘transformer’ style non-humanoid robots. RunningMan from IHMC, which used an Atlas, was the exception rather than the rule. 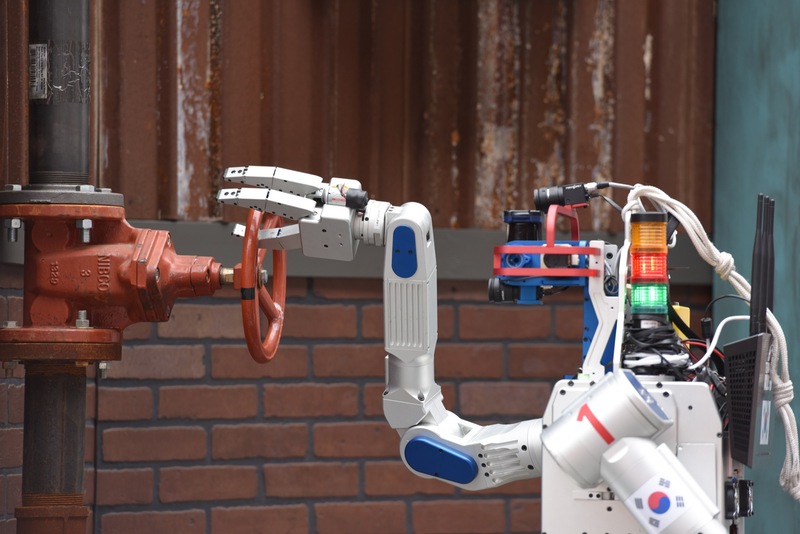 KAIST and CMU transformed from bipedal to wheeled or tracked, and CMU’s Chimp was the only robot able to right itself after a fall. RoboSimian used all four limbs and any body orientation it wanted to accomplish tasks, demonstrating that non-humanoid robots are both more successful at operating in human environments and just as capable of pleasing the crowd. So the story is out. Robots are ready for the real world, in limited but potentially lifesaving roles. They aren’t superhuman, and they won’t be replacing people any time soon. But they are capable of some useful things and they are fun to watch even if they are falling over instead of fighting. These robots are big and made of lots of metal and you might assume people seeing them would be filled with fear and anxiety But we heard groans of sympathy when those robots fell. And what did people do every time a robot scored a point? They cheered! It’s an extraordinary thing, and I think this is one of the biggest lessons from DRC—the potential for robots not only to perform technical tasks for us, but to help connect people to one another. 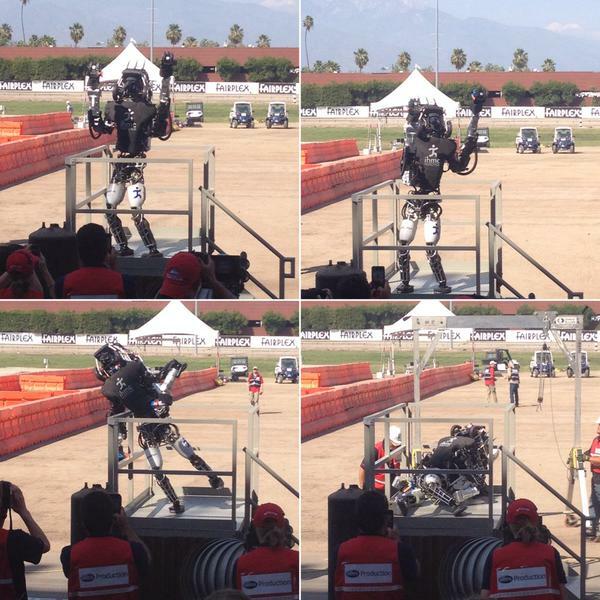 DARPA, you set the bar high and all the robot teams delivered! Congratulations to you all! But let’s lift the bar again at the next Grand Challenge. Teams were claiming that their diverse backgrounds gave them an edge over the competition. But diversity doesn’t just mean competitors from different countries, universities or disciplines. Diversity means many things including seeing more women in robotics. Raise the bar higher again, DARPA. It’s a strategy that obviously works.